A small cottage with a big view on a quiet lane. Cockle Cove Beach, rebuilt after Winter storms! A comfy couch with an ocean view! Compact kitchen does the job. All-clad pots, dishwasher, laundry. Water view dining, in or out! A mid-air view of the deck which over looks the ocean. An ocean view 24-7. Have you ever seen the moon on the water? As the sun goes down, the view evolves! The Cape that you remember can still be found at our cottage, “Overlook”, on Chatharbor Lane. Simplicity is the key to relaxation. 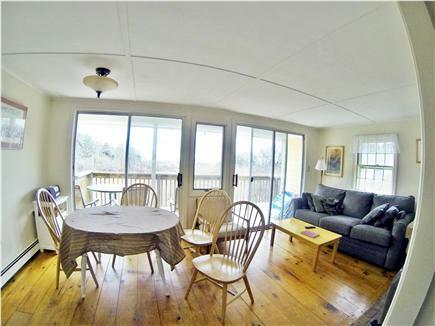 This cottage is easy to live in and has just what you want in a summer vacation house, and a true ocean view! 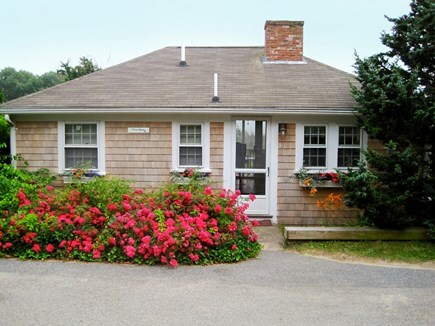 The Cockle Cove Beach property is located on Nantucket sound, five miles from Chatham's fine shopping district, about a mile from the bike trail and ice cream. If you like swimming, kayaking, sailing, windsurfing, kite-boarding (Forest Beach, an adjacent beach, is one of the top windsurfing and kite boarding spots on the Cape), or just quietly relaxing, you will love this beach. The cottage has an updated kitchen, renovated compact bathroom, flat TV, new Washer/Dryer and deck, most renovations all within the last five years. Though the beach is only 300 feet from the back door, the beach is accessed by walking to Cockle Cove Beach, a distance of nine hundred feet. Cockle Cove Beach stretches from Forest Beach to Ridgevale Beach with plenty of space to spread out. This is a pet free home and has been for more than a decade. There are window mounted air conditioners, but they are seldom used because the ocean breeze does the job nicely. 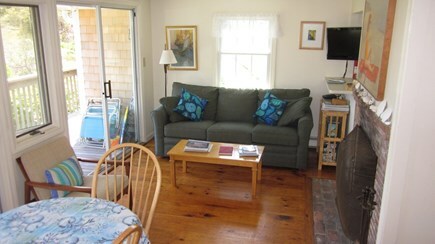 With Sun, Sand and surf... As well as WIFI, Cable, DVD player, this cottage has all that you need! The house is simple, as a beach house should be. Everything is on one level. The floors are wood, lots of glass faces the ocean and the windows offer the ocean breeze. 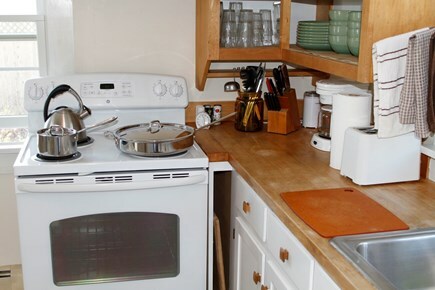 The kitchen has an electric stove and should please most chefs. The fireplace is suitable for small fires. A few Duraflame logs are in the closet for your enjoyment. There is a queen size bed and two single beds. In a pinch, the couch is actually a queen size pullout sofa bed that can used for extra guests. Occupancy is best with up to four people. The owners live nearby. There is very little yard but with nearly a mile of beach at hand, there is more than enough room for tossing a frisbee. There is no smoking inside of the building. Our guests have used wheelchairs here before. There is a four inch step up at the front door, however, so I will NOT characterize this as a wheelchair accessible layout. The single level is helpful. Thank you for staying with us and thank you for your kind words! It is always nice to meet with someone who appreciates what our little cottage has to offer! I hope to see you both next Summer! An enchanting view awaits you at this charming cottage. 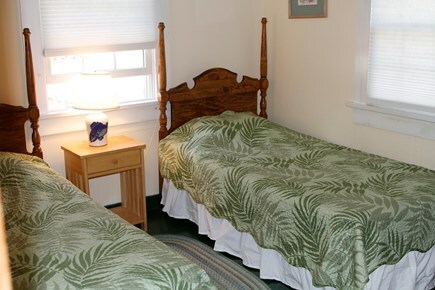 It is cozy and exceptionally clean, with all the amenities you need for a comfortable vacation. 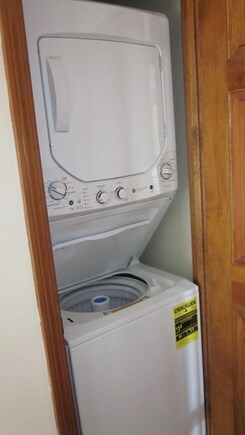 Ownership pride is evident here with investment in a new washer/dryer and a new dishwasher. What a magical spot! Janet, it was very nice to meet you, a fellow Chatham lover! Thanks for staying in our cottage... I hope we'll see you again soon! This is the perfect get-a-way ... just enough space with an endless view of the water. We loved the new bath, cozy living room and especially the deck. It was spotless when we checked in and the owners who live nearby were the perfect hosts.... full of ideas where to eat/shop and just enjoy a great vacation. We'll be back !! I'm glad you had a great time. See you in the Fall! This little cottage is easy to fall in love with - out the back door is a short stretch of flat marsh (with countless birds, animals and a lovely breeze) and beyond is the ocean. You can hear the lapping tide and see the sailboats as you sit on the deck and have your morning coffee. The beach is just a short walk and is absolutely lovely! Be sure to check out low tide, when you can walk out really far and still stay only up to your knees, and the tidal pools are filled with lots of critters. View alone is worth the stay. 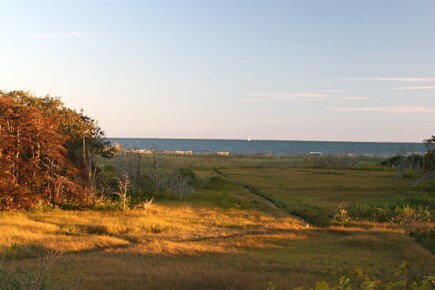 The yellow cottage is a nature lovers paradise, views of both the ocean and the marsh(which is teeming with wild life). The cottage was as described, clean and well supplied, just bring your bedding. Location was close to restaurants and attractions including a short walk to Cockle Cove beach. Would recommend to family and friends. Best stay in Chatham in over 30 years!!! This was our second time staying at the little yellow cottage and certainly won't be our last! The size is perfect for my husband and I and our two young daughters and the location is just perfect. The walk to the beach is short and pleasant and the view from the back deck is just gorgeous! We enjoyed watching a mother coyote and her two pups frolicking in the marsh behind the cottage a few mornings which was a special treat along with other wildlife and countless birds. 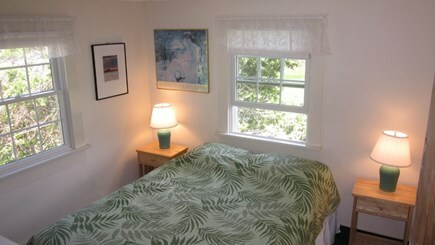 The beds were comfortable and the cottage is outfitted with absolutely everything we needed. Chatham is the perfect location for a family with young ones as there is a wonderful playground and ball field downtown along with fun shops and restaurants. Can't wait to go back! The cottage is perfect for me. The first time I saw it, I was so pleased because it was exactly like the online posting's description. I wanted a quiet, private place that would make me feel like I was living there, not just vacationing. 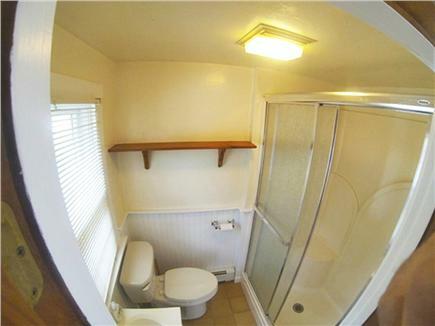 It has just the right amount of space and amenities. It is always clean (love the new bathroom remodel), the view is spectacular (sitting on the back deck is so relaxing) and it is very easy to get to. 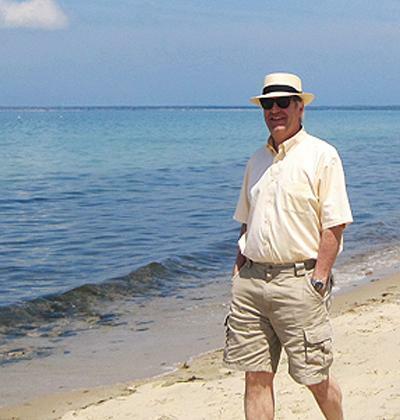 A great location from which to explore the rest of the Cape. Steve and Barb are so nice and allow you the peace you look forward to when getting away from it all. I have been there 5 times in 2 years and will be returning as long as they will have me. I love referring to it as "my cottage" and HIGHLY recommend it! My aunt and I have rented this little piece of heaven for three years in a row in the early days of May, and I'm afraid we do feel quite attached to it now. There's plenty of space for us since we each have our own room (but it would be fine for four adults and still doable for six friends). My aunt is in her 70's, so the single-floor layout is as important as the quiet neighborhood location. And we have all the conveniences of home: a well-appointed kitchen, comfy furnishings, laundry, TV, books, games, a fireplace, and more. 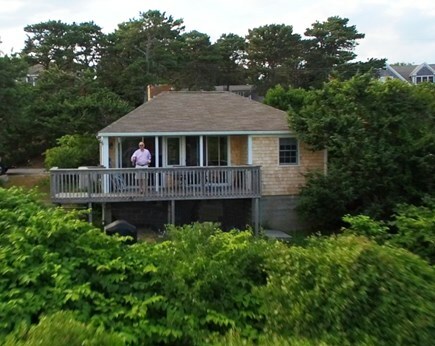 Of course the deck and view (to echo other reviewers) are bonus features that make this cottage a very special place. We love to stroll on the beach or pop into town for treats and shopping, but the location in Chatham is also convenient for exploring up or down the coast without making it a really long day. 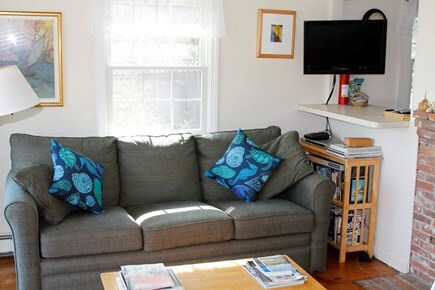 Steve (the owner) is friendly, accessible and helpful but rarely seen otherwise, so it feels like our own private cottage on The Cape, even if it's only for a few days a year. I am a Chatham Resident and local business-man. My Wife, Daughter and I are enjoying our twenty-second year in town. Really... what a nice spot. 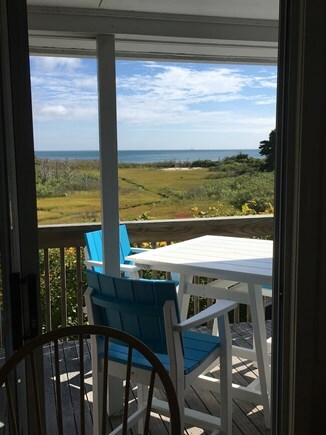 A wide view of Nantucket Sound, a sunny deck with a South-West breeze, handy fridge... what's not to like? When you key the door and walk in, you'll see the view and realize that this time, you did it right! Chatham is the place to be! Home to titans of industry, reclusive stars and working fellows like myself that want to live in my favorite place!